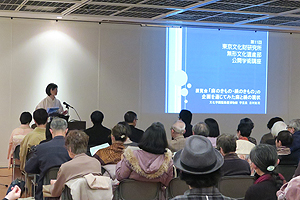 In collaboration with the Bunka Gakuen Costume Museum, the Tokyo National Research Institute forCultural Properties’ Department of Intangible Cultural Heritage hosted its 11th in a series of publiclectures, entitled “Ramie Kimono and Silk Kimono.”The afternoon program focused attention on ramieand silk, two fibers essential to thediscussion of Japanesetextiles. Presentations were given by individuals involved in local textile production and covered changes in the social milieu regarding ramie and silk, the transmission of production techniques, and the significance of keeping traditions alive. Regarding ramie (karamushi in Japanese), Yukiko FUNAKI of the Showa Village Association for Conservation of Karamushi Production Technique located in Fukushima Prefecture gave the talk “Passing on Karamushi Techniques—Efforts at Showamura.” Tomoya YOSHIDA of the Higashi-Agatsuma Town Board of Education in Gunma Prefecture presented “Passing on Hemp Techniques—Efforts in Iwashima,” in which he spoke of the importance of techniques for cultivating hemp for textile use and how to extract the fiber from the plant, as well as the difficulties of passing on this knowledge. Joining these two voices from production locales was Kumiko HAYASHI of the Okaya Silk Museum in Nagano Prefecture. Ms. Hayashi spoke about the technological innovation that supported modernization in the silk industry and emphasized the significance of keeping such activities alive. After these reports, Mr. Kensaku KIKUCHI, guest researcher in the Department of Intangible Cultural Heritage, gave the talk “Ramie Kimono and Silk Kimono in Folklore,” and Bunka Gakuen Costume Museum curator Koka YOSHIMURA explained the exhibition, using the title “The Current State of Ramie and Silk Ascertained through the Planning of the ‘Ramie Kimono and Silk Kimono’ Exhibition.” A tour of the exhibition at the Bunka Gakuen Costume Museum was then conducted. To transmit the culture surrounding ramie and silk kimonos requires knowledge of techniques involving the actual raw materials, hemp and silk. The lecture program taught attendees about the many issues involved in carrying on traditions involving ramie and silk and aimed to raise interest in the importance of preserving not only the techniques for making kimonos, but the techniques for extracting the fibers used as the raw materials. The Department of Intangible Cultural Heritage will establish a forum for discussing the many problems associated with traditional textile techniques.